Sarasota County Schools accepts its award from Cambridge International. 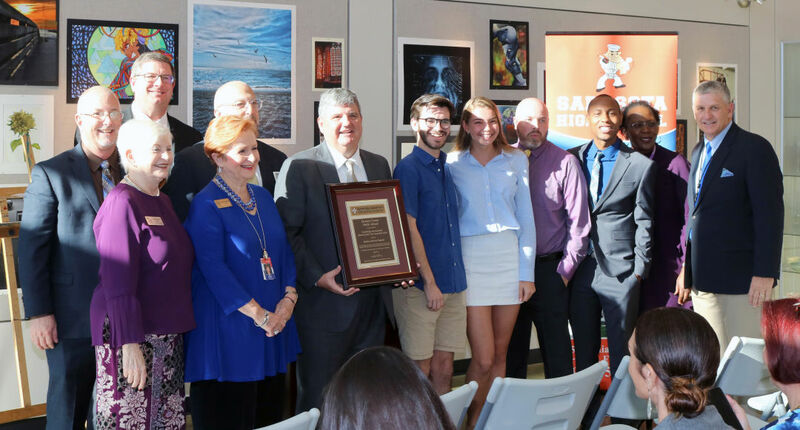 Sarasota County Schools has received the District of the Year Award for 2017-18 in the mid-sized district category from Cambridge International, the world’s largest provider of international education programs. The Cambridge program was developed by Cambridge International, which is part of the University of Cambridge in the United Kingdom. The award recognizes districts that have a consistently high learner performance rate on Cambridge’s internationally benchmarked examinations; that have a higher than average in percent of students who receive awards for top performance; and that have provided program access to students of diverse backgrounds and experiences. The Cambridge program was first implemented at Sarasota High School by then-teacher Merlin Schenk in 2011. The program has grown over the years to give students access to an international curriculum known for rigor and relevancy. Currently, students at Booker High School, North Port High School, and Sarasota High School are enrolled in the Cambridge program. Participating students and instructional staff alike benefit from a plethora of resources designed to enhance global access and lifelong learning. More than 600 US colleges and universities, including all members of the Ivy League, Massachusetts Institute of Technology (MIT), Duke University, New York University, University of Washington, and University of Virginia accept Cambridge exams for credit and placement.